Let’s be clear about one thing…. Here in Vegas, where we currently live, it is not common for most people to have “Garden Parties”…especially during the summer. It is VERY hot and, thanks to the lack of water and dry ground, most people do not have lush green yards with vegetation growing and flowers aplenty. This has been hard for me. Being a native Californian and from the Sacramento area (a.k.a. The City of Trees) and adopted Texan by marriage (where we have lush, green rolling hills and gorgeous trees and farms outside all big cities where it becomes rural), this desert landscape has been one of the HARDEST adjustments for me when moving here last year. Nothing, and I mean NOTHING, will keep me from having a garden party! I will find a way around it. We may not have a garden or vegetation in our backyard. We have cement walls instead of fences and desert rock instead of lush, green grass. But we have a fig tree and a couple of bushes! And I have a gorgeous vintage tea cart and roses from the grocery store! 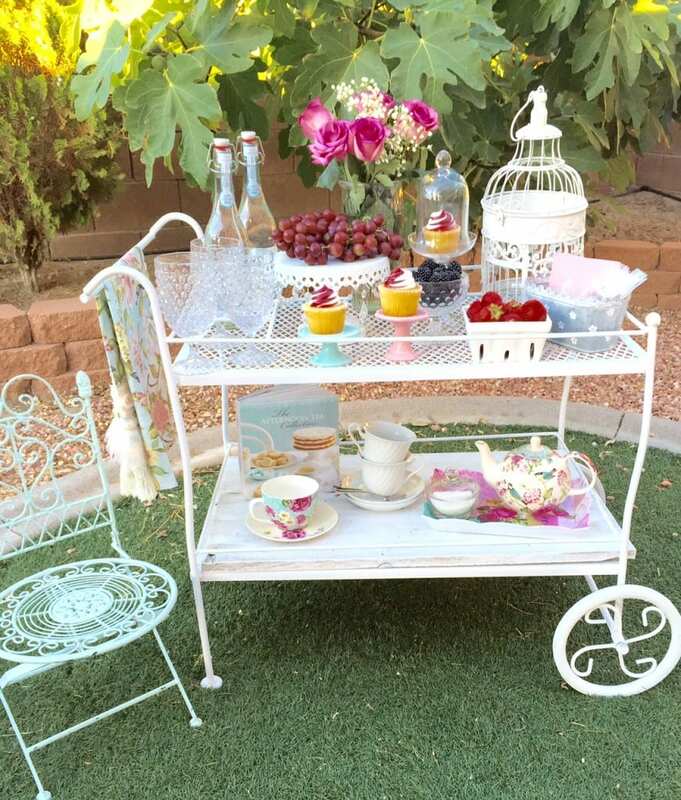 So by golly….we will have a garden tea party LOL! 🙂 Perfect timing, since I had a few special guests for tea JUST as the sun was going down, it was cooling off, and a breeze started to grace us with its presence. Love love love this! So pretty 🙂 Makes me want to invite all my girlfriends over! And I don’t blame you for having a tough time leaving California! I only ever lived in Australia and here and wouldn’t want it any other way (OK, maybe Scottsdale and Hawaii, but that’s it! ).